This is the second Portal tomb in the Burren townland, although it has collapsed it is still a great example to visit. 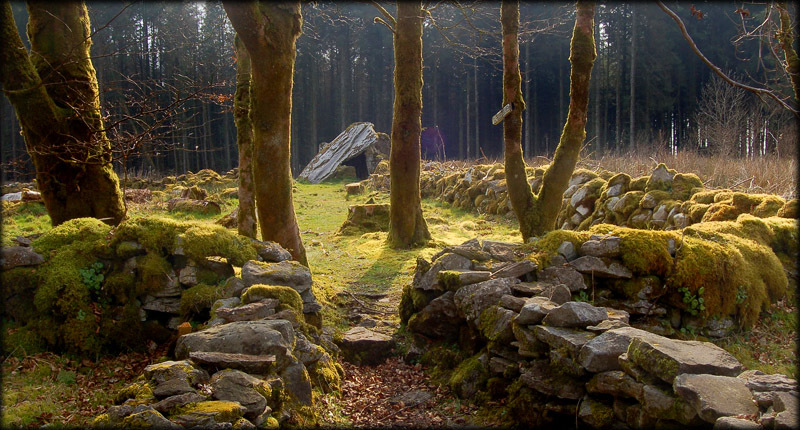 As you walk along the prehistoric trail through the pine forest this tomb is approximately 400 metres from the main entrance situated on the western side behind a ruined house. The tomb has two matching portal stones,shown in the image right, standing at a height of about two metres, the area between the portal stones has been bricked up and the chamber used to house calves. The displaced capstone which measures 5 metres by just over 4 metres is resting on one of the portal stones and a side stone. The monument has also been incorporated into a modern field wall. This Dolmen is also well sign posted and on the opposite side of the trail is another sign pointing to the Giants Leap which is the third tomb we visited. 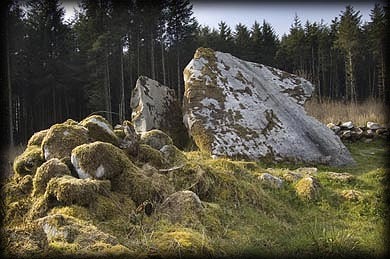 Situated: In the Burren prehistoric complex About 4 kilometres south of Blacklion on the Cavan Way. After you enter the Forest, this tomb is approximately 100 metres down the trail on the southern side. Discovery Map 26: H 0748 3511. Last visit April 2007.